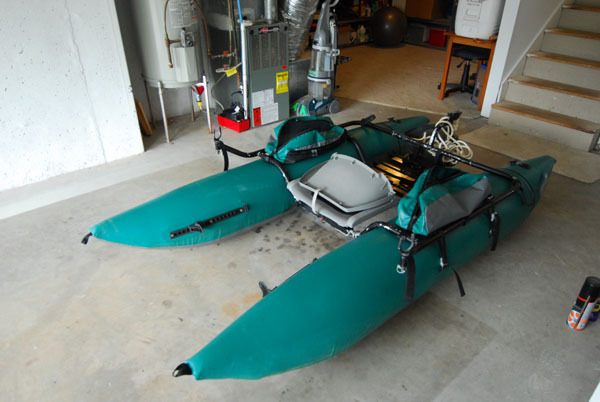 We’re all familiar with one-man pontoon boats; those inflatable single person watercraft which range from small, pond-appropriate single-bladder floats on up to whitewater grade, three-man catarafts. Most pontoon boats have an internal bladder made of a lighter grade of material than the multi-dernier PVC exterior we actually see. 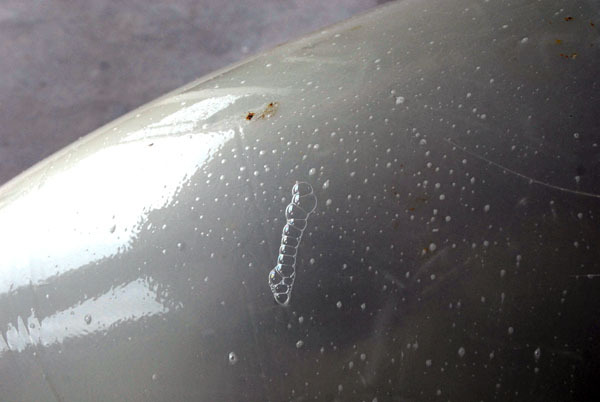 On many boats, this is a polyurethane bladder, which can be easily patched. 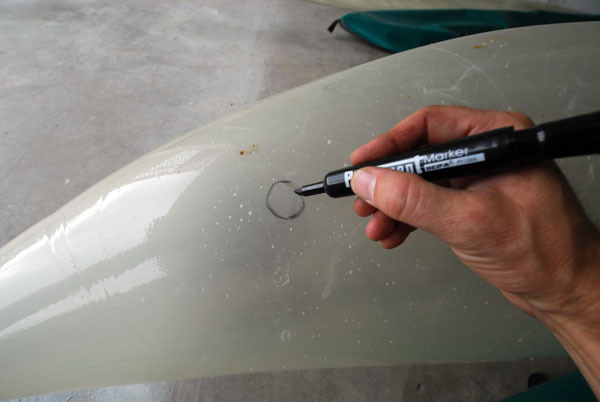 (Some boats have a PVC bladder which may require special glues; these instructions apply only to the more-common polyurethane models). 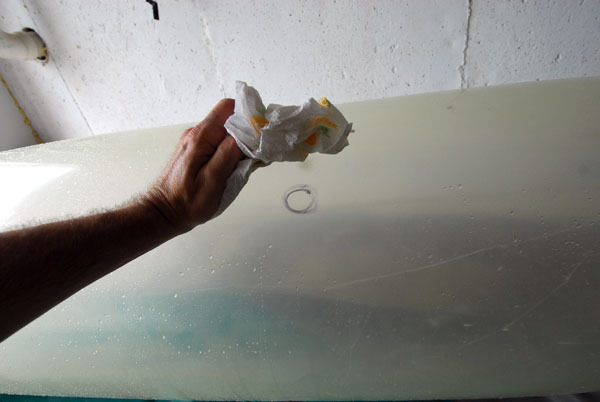 Over time, creases in the bladder, sharp impacts, or sheer wear-and-tear can cause pinhole leaks, which prevent the pontoons from retaining air. Oftentimes these leaks are most noticeable after a long day on the water or a period of storage. They may develop when the boat is broken down for transport (a practice best to be avoided as much as possible). Repairing these leaks is a hassle but certainly doable and worthwhile. A boat that does not leak will require less fatiguing pumping and will ride better throughout the day. We’ll be repairing this 2000-era J.W. Outfitters “Renegade” boat, a nine-foot craft similar to many other models on the market, such as those made by Water Skeeter or Scadden Boats. 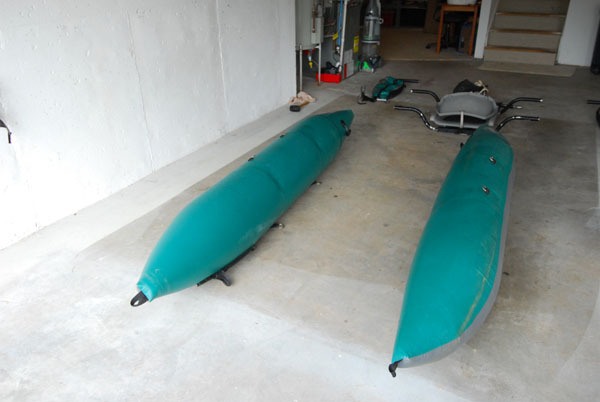 Start by disassembling your pontoon boat if you have not already done so. 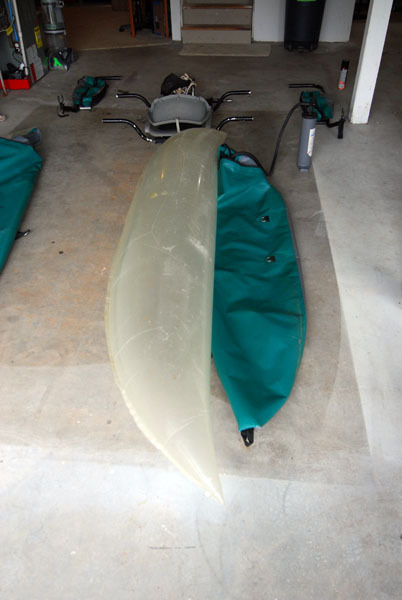 When the boat is deflated, look carefully for the zipper access to the internal bladder. On the J.W. Outfitters boats, this zipper is hidden by a flap on the rear of the pontoon. Extract the tubes from the casing and stretch them out carefully. Best to do this in a clean area free of sand, gravel or debris which might scratch or otherwise damage your bladder. 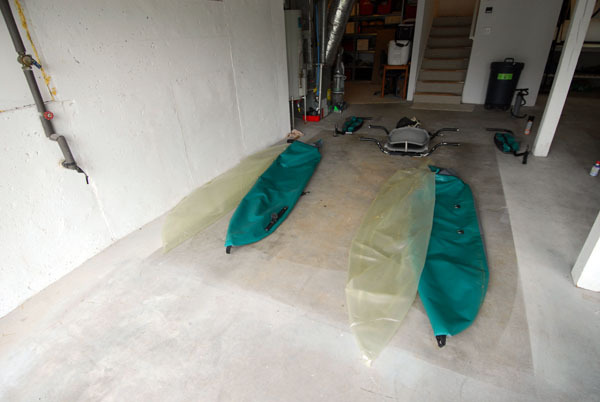 Attach your pump and inflate the pontoons. You are going to over-inflate them by about 20%; when inflated inside the cases, the bladders are not actually fully charged. You want them to be tight but not so taut that they make pinging noises when you touch them or make a pump stroke. Once inflated, fill your squirt bottle with water and a generous dollop of liquid dish soap, then liberally spray the entire bladder. Look closely. 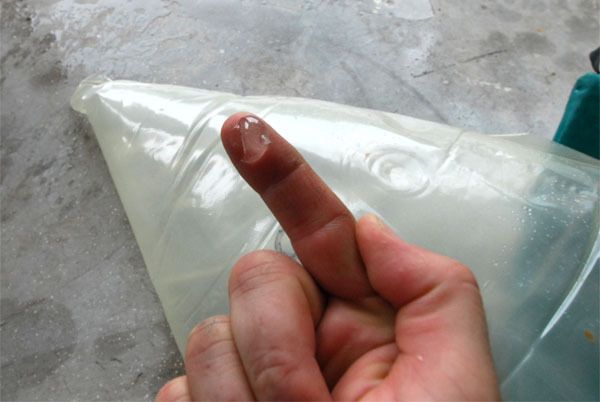 You will see bubbles growing from pinhole leaks, and may even hear the air squealing as it leaks out. Soap causes the squeals to increase in volume, making them easier to find. 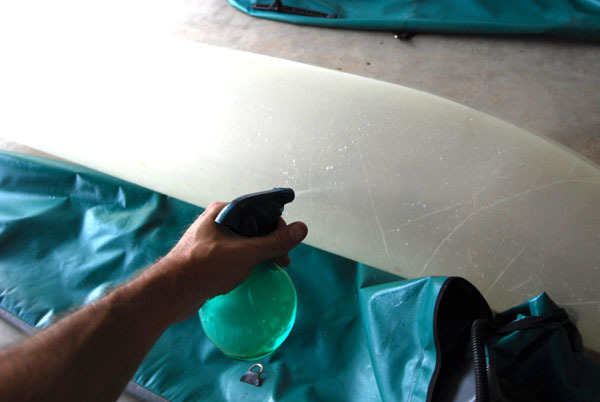 The key is to watch for bubbles that grow; not those that merely formed when you sprayed the boat. Sometimes they will leave a trail (like in the photo below), which is easy to follow. When you spot a leak, wipe off the soap with your rag and circle the area in permanent marker. (Don’t worry, this will be hidden when the bladders go back inside the cases). Work slowly and cover the entire surface area of both pontoons. When you’ve found and circled all your problem areas, hose off the bladders so they do not remain soapy. Deflate the bladders so that the leaks are no longer under tension. 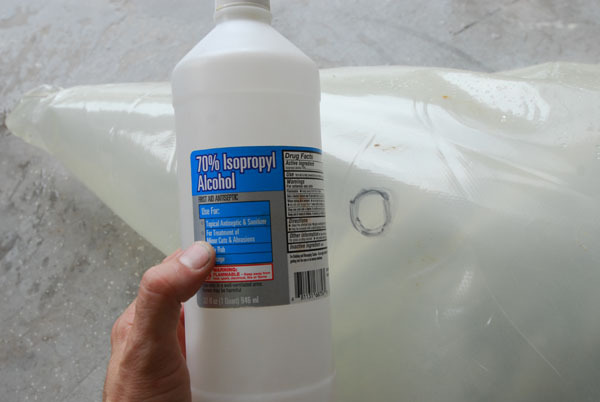 Then, pre-treat your circled areas by wiping the surface area with rubbing alcohol. Finally, using your toluene glue, apply a generous, coin-sized (and coin-thickness) amount of glue over the pinhole leak. Let the patch dry overnight or for a few hours, then tuck the bladders back into their cases by grabbing the inside of the tip of the case and holding it to the tip of the bladder while you stretch the case back to its full length. Lubricate with water if necessary. When you’ve tucked the bladders back in, take care to make sure both tips are filled by the bladder ends, then zip your cases up and re-inflate. You’re done! 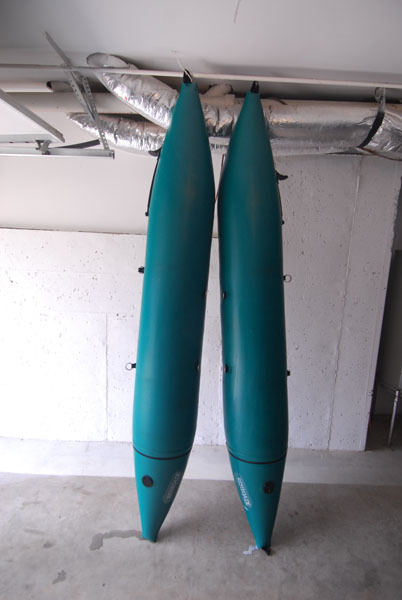 Repairs made this way last for years, but they will be strongest if you leave your boat inflated as much as possible. 27 Responses to "How To: Repair a Pontoon Boat"
any suggestions how to repair a hole on the bladder seam? Stitch it back together yourself for cosmetic purposes then apply a patch kit to the inside for structure. You might need to also order a valve wrench so you can remove your current valve and re-situate it to fit the factory opening on the replacement bladder. 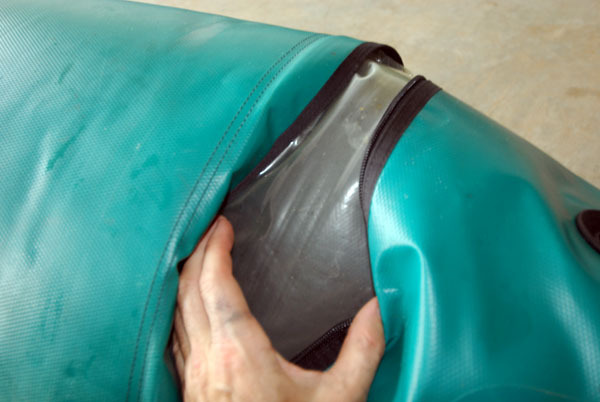 Once you have it very carefully located, use a hole saw or punch die to make a new hole in the PVC cover, and reattach the valve. Most valves screw together with a rubber washer in between for air tightness. 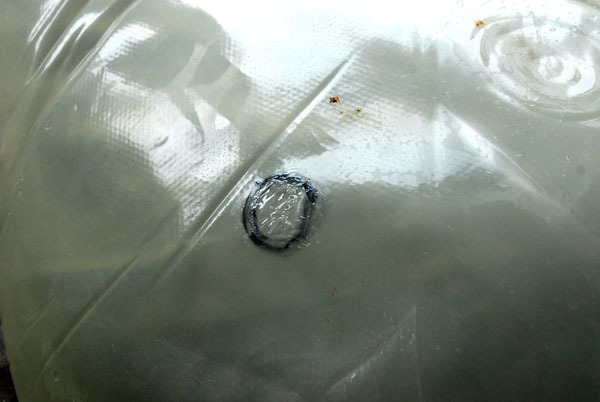 Then you just need to patch the old hole with a piece of material from a raft patch kit. I need information on where I can find a repair kit for the casing on a water skeeter pontoon boat. A seam ripped out and the blatter has pushed out the rip. The blatter is still good..
did you ever find out how to repair or replace the case? I have the same problem! I have a Water Skeeter RGB50110A Guide Pro 10ft Pontoon boat. I need to replace/repair valve or a new bladder. Who does this type of work? Phil, you can do it yourself. Look on a website called coverbonanza.com and see if you can find a match for your valves first. How do u repair a leak around the valves of the Renegade pontoon ? I’m glad I found this site. I have a Renegade boat with a leaking valve. Doing some searching I found the replacement valve is a Halley-Roberts 690nSBV. They have them on Amazon plus the tool to remove them. Thanks for getting me started in the right direction. That should be Halkey not Halley. As indicated in another post, I did buy a new valve and the tool for removing it. I cannot get the valve to budge when trying to unscrew it. Both the leaky one and the other one are stuck tight. Is there any way I can libricate the valve to help loosen it? I’ll answer my own question. Initially I grasped the nut inside the pontoon and tried to unscrew the outer part, but couldn’t do it. I read on one of the sites I searched to kneel on the deflated pontoon with knees either side of the valve. That worked and I could unscrew the valve. I have now installed the new one. No apparent leak. I have a JW Outfitters Scout. Any additional tips for reassembling bladder inside cover to prevent twists? I noted you suggested lubricating with water if necessary. Tried that and I’m still finding a twist by the valve upon re-inflating. Would it hurt to put a bit of soapy water between the bladder and cover to provide some extra lubrication? I soap the inside liberally and make sure to align the bottom seam with the bottom of the tube. I stuff the tip in and grip it firmly from the outside, while extending the exterior sleeve back to its full length. Then I straighten it all out before inflating. I have Water Skeeter Model # GGB3902A. It was folded and improperly stored outside for approx. 4 years. Approx. 20% of the exterior skin has peeled off. Can I recoat it and if so with what and where can it be purchased? You need to repaint the PVC top coat. There are several products for that if you google it. Raft companies like Aire will also know how to handle it so you might ask them. I have an 8 ft Water Skeeter with easy access to remover the bladder. How do I remove/detach the valve from the PVC cover to completely remover the bladder? Or do I leave the bladder and valve in place with the cover while making repairs? Jim, most likely, you need to identify the brand and type of valve they used, then you should be able to order a wrench off the internet which will let you unscrew the fitting. Most of these have a compression fitting with a nut hidden on the inside of the bladder, and if you just have the right wrench they are easy to unscrew. Don’t even think of trying it without the right wrench — you will definitely tear up the valve. I have a River Guide Water Skeeter. The valve broke off *in* the bladder. I assume I have to replace the bladder since there’s no way to get valve out. Is there a compatible bladder by another manufacturer? Actually, it should come out. Every valve I have seen is pretty simple. There’s a kind of cup shaped “nut” that you pass inside the bag through the hole it comes with (the material is plenty stretchy). You then insert the screw-shaped valve stem into that nut and tighten with the appropriate wrench. It sounds like you just need to locate the right wrench and disassemble your valve and replace it. Once you unscrew the valve the inside bits should also fall out or at least be able to be pulled out. I have an old water skeeter 2 man the one valve has separated from the bladder the o ring has just let go, I think i can repair it , I am just wondering what type of glue or cement I should use for the best results? John, best move is probably going to be ordering a new valve (they aren’t expensive) and valve wrench, then simply re-setting the fitting. That assumes the bladder itself is sound. I would order the valve wrench first — check the top of the valve to ID the exact make/model. Once you have that in hand, disassembly is simple and you might even be able to re-seat your present valve. None of the ones I have seen have an O-ring per se; they are more of a compression fitting. It’s possible your bladder has ripped at the valve. I have a Skeeter Freedom pontoon boat. I tried to install replacement valves that I bought a Gander Outdoors but the valves leak (I had to break off the spring loaded valve body to install the replacement valves). I installed the new valves which come with an attachment that I can use to fill them with air from an air compressor. I think the connection is called Schrader, just like tire stems. I charged the tubes up just fine but they leak air. What can I use to seal the new screw in valves? Is Aquaseal the trick?